When it comes to nail polish I struggle. I struggle to apply it smoothly, I struggle to have patience while waiting for it to dry and I struggle to do my right hand. Because of this I go through phases. I will wear it for a while then I won't wear it for months. Then I spot a girl with killer nails and go on a mission to buy some new hues. 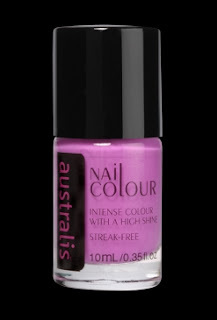 I must of been envious of someone recently as I ended up purchasing Australis nail polish in "Bombshell" pink; and can I just say, this nail polish has exceeded all expectations. This is the most chip resistant nail polish I have tried. I am pretty clumsy so usually I chip my hard work within the first couple days but it's still going strong. Woo hoo. I highly recommend this item and for $7.95 you can't go wrong. I will be investing in Blue Tiger and Citrus colours next time I hit the shops.